New Compact Style of Electrotherapy Designed for convenient treatment from beginning to end, including cleaning up the treatment area and storing electrode cords. Designed for convenient treatment from beginning to end, including cleaning up the treatment area and storing electrode cords. *Usage example of the tray. These plastic boxes are not included in the unit. 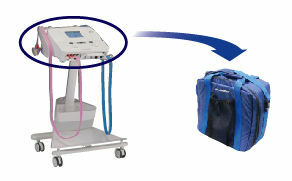 The tray at the top of cart is useful for storing clean alcohol swabs, spray bottle and medical equipment. After cleaning, simply discard the swab into the trash box under the cart. Push the suction button first, then place the suction cups on the treatment area. If you are not sure about the treatment points, press T-point(Treatment point) button in the screen to display treatment guidance for each diseased area. When the treatment is finished, you will hear the ending sound. Push the suction button to remove the suction cups easily from the treatment points. 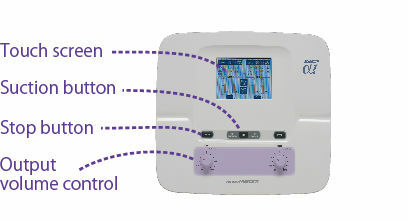 The touch-screen lets you make detailed setting, while the minimum function needed to perform treatment are conveniently located on top of the equipment. The unit and cart can be easily separated by loosing just one screw and removing power supply cord, exhaust tube and drainage tube from the unit. The carrying case is ideal when going out. IFC therapy utilizes low-frequency stimulation generated by the intersection of two slightly different medium-frequency currents, which causes no irritation to the skin surface like low-frequency current. IFC Alpha1 offers three treatment modes: “CI”,“CM” and “NM”. In addition, the User Program can be used to customize the treatment pattern freely. “CI” stands for combined IFC. This mode of treatment combines IFC and IFCW, and creates comfortable stimulation. “CM” stands for combined modulation. This mode uses two types of modulation wave, and creates strong stimulation. “NM” stands for normal. This mode is the traditional Interferential Current Therapy devised by Dr. Nemec. You can choose NMES to train the muscles. 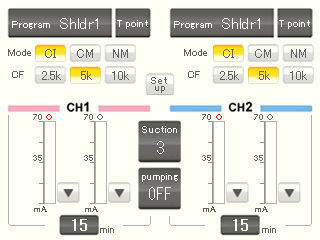 According to the treatment purposes and symptoms, “Custom setting” can be used to configure each of “Band of interferential frequency”, “Type of interference” and “Type of modulation wave”. The doctor can create up to five own programs as User Program. IFC Alpha1 has built-in treatment programs that are often used for each body part. 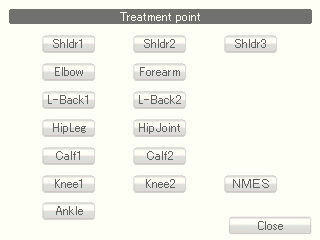 The program configures the mode and frequency for each part such as the shoulder, elbow, back etc. 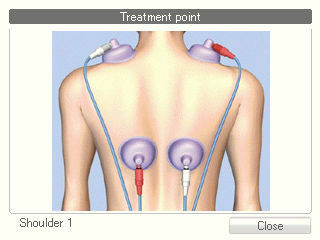 Upon pressing the T-point button, it displays an image of the treatment point for the selected program. 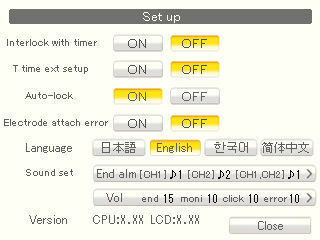 Multi-language support makes it even easier to use. 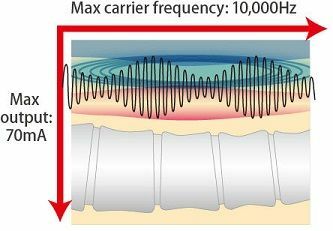 IFC Alpha1 use a carrier frequency of 10,000Hz to reduce the skin resistance in addition to 2,500Hz and 5,000Hz. It creates soft and strong stimulation in combination with an output current of up to 70mA. The gel electrode is suitable for NMES or treatment of small areas. Copyright © 2019 creatsign.com . All Rights Reserved.